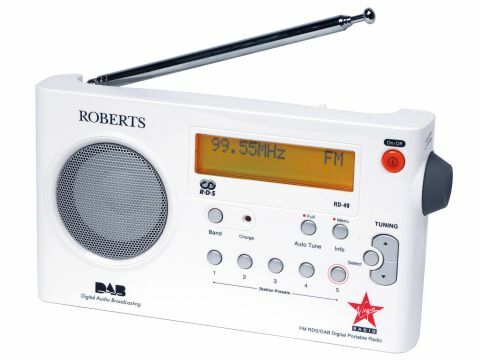 Following Pure Digital's One's dabble with a TalkSPORT branded digital radio comes Roberts' flirtations with both Virgin Radio and Classic FM (the Gemini RD-49 is available with both stations' branding). It's a marketing ploy that makes a lot of sense for a speech-orientated DAB radio such as the Gemini Virgin RD-49, one of the tiniest models we've tested that hasn't been aimed at the portable market. The logo branding of Virgin combined with five preset buttons, an orange/black LCD screen with huge scrolling text and a garish orange on/off button does give the Gemini RD-49 a cluttered look, but the white fascia still impresses. The tiny unit sports a rubber volume dial on the opposite side to the headphone socket and power input (a messy solution), with a retractable aerial on the top. The retractable aerial is critical because, as you may have guessed from its over-tiny size, the RD-49 is also portable. As well as taking six AA batteries in its rear, something that, frankly, makes the radio too heavy to carry in one hand, the RD-49 can also accept rechargeable NiMH batteries - and also replenish them after around 7hrs charging. This only works when the radio is completely switched off. Other than this novel talent, which allows around 15hrs of portable listening, the feature count is scant on this £60 DAB radio. The RD-49 does belie its budget status, though - build quality is above average at this price point. The unit keeps a solid reception (the trade-off being a bulky aerial) and the design allows functional and simple operation. An initial full scan of all DAB stations in the area takes around 15 seconds, and the display can be toggled to show programme type, scrolling text (such as news headlines or web addresses), signal strength, time/date and bitrate. As a DAB radio ideal for voice radio, the RD-49 benefits from dynamic range control (DRC). This audio tweak effectively brings quieter sounds to the fore, although it does involve depressing the menu button for two seconds to access the menus - something we're not convinced most users will ever discover through everyday use. Software details and an option for factory reset are also squirreled away. Presets are available for DAB stations, with the fifth button red-ringed and primed for Virgin Radio listeners. No surprise there, although sound quality through its mono speaker is so limited that we can't recommend this unit to music fans tuning into Virgin radio - the RD-49 will possibly better serve Radio 4 listeners. Voice radio, transmitted at low bitrates by DAB stations in the UK, is rendered precisely, although music does sound distant, muffled and lacking in bass rumble. With a limited brief met by Roberts, the Gemini Virgin RD-49 is a good first DAB for a music hater's kitchen or desktop. If you're seeking more sophistication, look elsewhere.